Note to self: it doesn't matter how much you want to get past the first 20 rows of your International Scarf Exchange Project, it is not advisable to knit while operating a show comprised mostly of Snap cues and critical visuals! No wonder I have to now frog the last 10 rows I did last night. 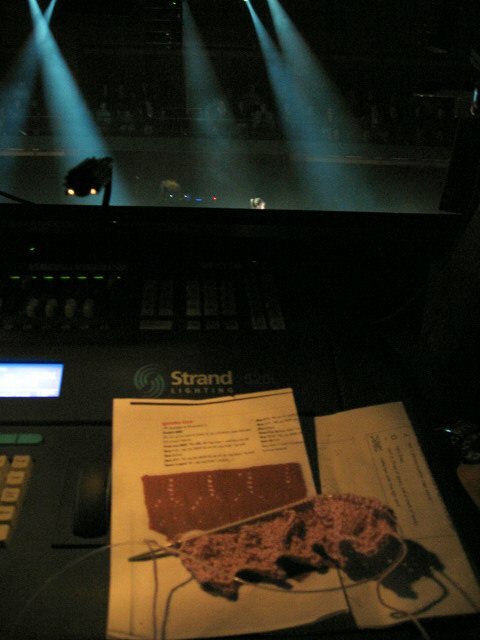 These 20 rows of Lace have been on and off the needles so often they must be feeling seasick. I was commuting by car this time so I didn't have 2 hours of dedicated knitting time to fix it, as I do travelling by train. At least I'm past the first 18 rows of Nicky Epstein's Gazebo pattern from "Knitting on the Edge" and when I repeat it for the other end I (hopefully) will have learnt from my mistakes. 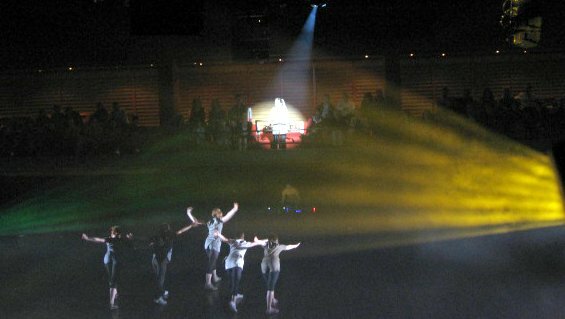 The show was an energetic dance piece called Special Mention, nicely lit by Bernie Tan. 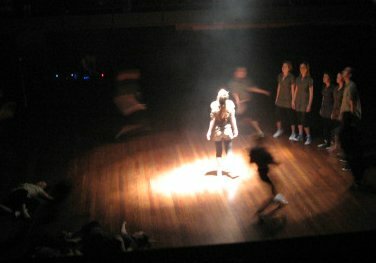 It was a collaborative work commissioned by the House and involving young dancers, aged from 14 yrs to 26, from all over Sydney. There was a lot of Teen Spirit around and except for the odd outbreak of 'Whateeever' and 'Shut uuup" it wasn't too excruciating. The cast and crew had a lot of fun and the music was LOUD. The audience of Sydney Symphony's performance in the Concert Hall may have noticed a 'doof, doof' back beat to the Mozart Overture. I had earplugs in one ear and a big headset on the other. All in all it was a good day - the Stash sale at the Mountains Knitting Guild went well and I divested myself of one packet of Op Shop wool (replaced by two skeins of hand dyed Merino!). I think I will have to start selling stuff on ebay if I am serious about getting some stash reduction happening. At least the Bluebell Crepe went to a good home. Janette traded me a lovely pair of wooden Addi's for it. Go and check out her 'quick knit' in Cleckheaton Cotton Soft that she 'just threw together'. Classic lines and beautifully finished.